Indian Prime Minister Narendra Modi received a rapturous reception in New York City on Sunday, speaking to more than 19,000 people — largely Indian Americans, according to The New York Times — at Madison Square Garden. During his packed five-day visit, Modi also addressed the UN General Assembly and met with a bevy of U.S. business leaders Monday morning before heading to an “intimate dinner” with President Obama. This is the first official trip to the U.S. for Modi, who was elected in May. His visit not only marks an effort to repair strained U.S.-India relations, but also spotlights the growing presence of Indians and Indian Americans in American life. Two sitting governors (Louisiana’s Bobby Jindal and South Carolina’s Nikki Haley, both Republicans) are of Indian ancestry; so are Preet Bharara, U.S. attorney for the Southern District of New York, and Neel Kashkari, former Treasury Department official and current GOP candidate for California governor. 1 Many Indian Americans are recent arrivals. 87.2% of Indian-American adults in 2010 were foreign-born, the highest percentage among the six largest Asian-American groups; 37.6% of those had been in the U.S. 10 years or less. One consequence of so many Indian Americans having arrived so recently: Only 56.2% of adults were U.S. citizens, the lowest share among the six subgroups studied in detail. 2 Indian Americans are among the most highly educated racial or ethnic groups in the U.S. 70% of Indian Americans aged 25 and older had college degrees in 2010, by far the highest rate among the six Asian-American groups studied and 2.5 times the rate among the overall U.S. population. More recent (2013) data from the American Community Survey provides more detail: 40.6% of Indian Americans 25 and older have graduate or professional degrees, and 32.3% have bachelor’s degrees; an additional 10.4% have some college education. One likely factor: the large segment of Indian Americans who entered the country under the H1-B visa program, which allow highly skilled foreign workers in designated “specialty occupations” to work in the U.S. In 2011, for example, 72,438 Indians received H1-B visas, 56% of all such visas granted that year. 3 Not all Indian Americans are Hindu. Only about half (51%) of Indian Americans are Hindu, though nearly all Asian-American Hindus (93%) trace their heritage to India, according to our 2012 survey. 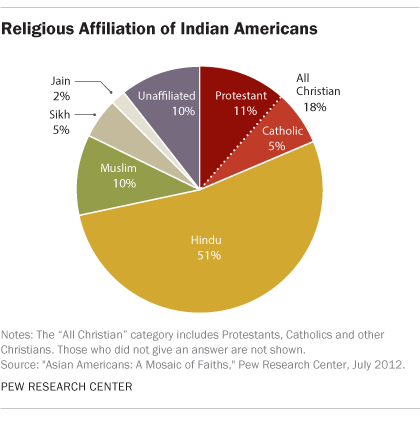 18% of Indian Americans identified themselves as Christians (as both Haley and Jindal do); 10% said they were Muslim. The religious shares of Indian Americans are markedly different from those of India itself (where an estimated 79.5% of the population is Hindu and only 2.5% is Christian, according to Pew Research’s 2012 Global Religious Landscape report), reflecting differential migration patterns. 4 Indian Americans generally are well-off. Median annual household income for Indian Americans in 2010 was $88,000, much higher than for all Asian Americans ($66,000) and all U.S. households ($49,800) — perhaps not surprising, given their high education levels. Only 9% of adult Indian Americans live in poverty, compared with 12% of Asian Americans overall and 13% of the U.S. population. In 2010, by our analysis, 28% of Indian American worked in science and engineering fields; according to the 2013 American Community Survey, more than two-thirds (69.3%) of Indian Americans 16 and older were in management, business, science and arts occupations. 5 Indian Americans lean left. 65% of Indian Americans were Democrats or leaned toward the Democrats, making them the Asian-American subgroup most likely to identify with the Democratic Party. An identical share of Indian Americans approved of Obama’s job performance in 2012.